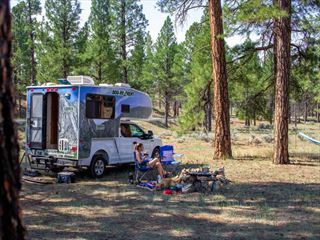 This three week road trip takes you on the ultimate journey through the western states of the USA. Beginning and ending in Los Angeles, you will travel through the states of California, Arizona, Utah and Nevada, visiting awe-inspiring national parks, staying in great cities and seaside resorts and soaking up the whole Americana experience. 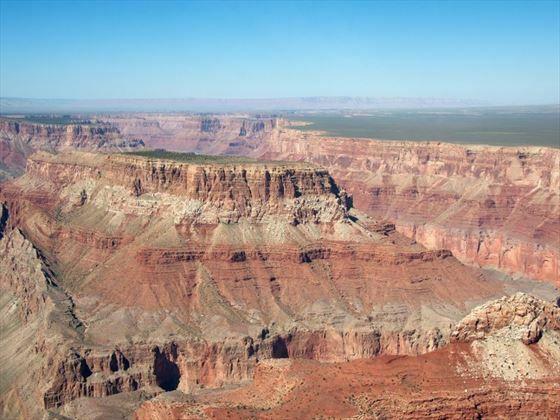 Where will the highlight be for you – Marvelling at the Grand Canyon? Navigating through Death Valley? Exploring Yosemite National Park? Or driving the stunning Pacific Highway? Pick up your rental car and head south to Anaheim in Orange County. Choose from the great attractions in the area – Disney Park or Disney California Adventure Park, or perhaps visit the oldest theme park – Knotts Berry Farm – filled with old west history and quirky rides (admissions not included). There’s also great shopping around Anaheim, so you could pick up some extra outfits for your adventure ahead. Today you’re heading into the desert and onto the oasis Palm Springs. This fun resort, nestled at the base of the majestic San Jacinto Mountains offers a seductive blend of entertainment and relaxation. 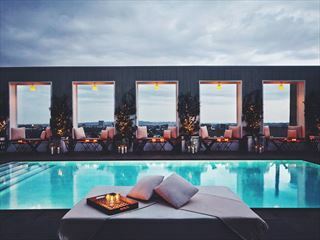 either just chill by the pool, or browse the quirky shops and galleries. Or you could take the awe-inspiring journey up the sheer cliffs of Chino Canyon aboard the Palm Springs Aerial Tramway to capture spectacular views of the desert. Travel east through the Coachella Valley to Phoenix and Scottsdale in Arizona. Experience the contrast of Phoenix’s skyscraper skyline and Scottsdale old west charm. You’re now going to be heading north and into the Grand Canyon National Park, a wonderful journey through stunning scenery. Visit Montezuma Castle Monument and its well-preserved cliff dwellings, the picturesque city of Sedona surrounded by red rock monoliths, and Oak Creek Canyon – a densely forested gorge known for its colourful rock formations. Explore the South Rim of the Grand Canyon, visit a photo hot spot or stroll the Rim Trail, so that you can take in the wonder of this amazing natural phenomenon. Then drive through the Navajo Reservation and onto Lake Powell – a vast, blue man-made lake surrounded by beautiful sandstone walls. A full day to enjoy Lake Powell and its surrounds. You might want to take a cruise along the lake to Rainbow Bridge, the largest natural bridge in the world. 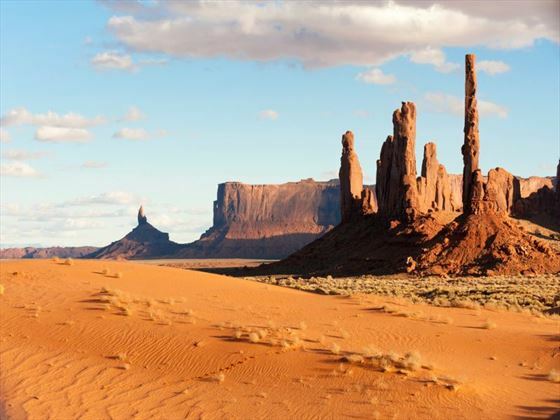 Or you could visit Monument Valley Navajo Tribal Park, where sandstone pinnacles, arches and mesas in hues of red and orange rise out of the sandy landscape. 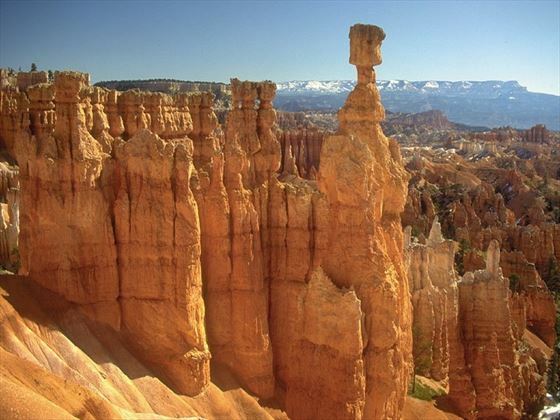 Drive west to Kanab then head north to Utah’s Bryce Canyon National Park. Famous for its pink cliffs and hoodoos – thousands of spiral rock formations. 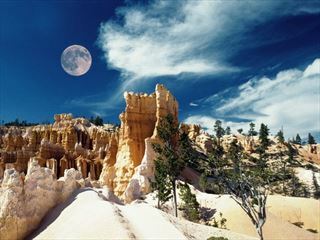 Spend the morning exploring Bryce Canyon then go west into Zion National Park. This is Utah’s oldest national park and here you will find massive sandstone cliffs of cream, pink and red, soaring into the blue sky. 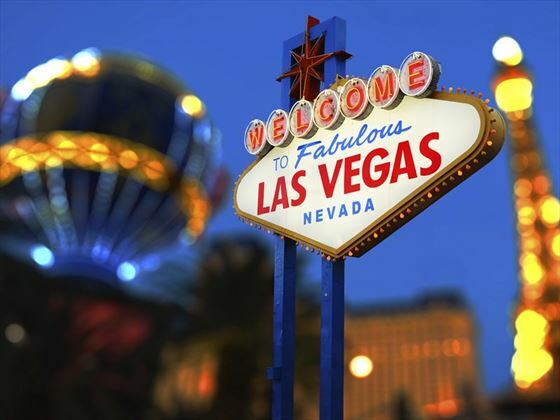 Then continue west to Las Vegas – a city that needs no introduction. Enjoy a full day in Las Vegas, where there is something for everyone. You could simply relax by the pool and enjoy a wonderful meal in one of the world-class restaurants, or you can take your chances at a casino, take in a show, shop til you drop, ride a rollercoaster…the list is endless! Today’s journey takes you to the lowest elevation in America – Death Valley. Pause at Zabriskie Point which offers spectacular views of the wildly eroded and vibrantly coloured Badlands. This evening you must venture outside to gaze at a million stars in the night sky. This morning travel south into the High Sierra where the highest driveable pass in California – the Tioga Road – leads you into Yosemite Park (NB: from early November into late May the Tioga Pass may be closed due to weather conditions, so you would need to drive the southern route through Bakersfield and Fresno into the Yosemite area). 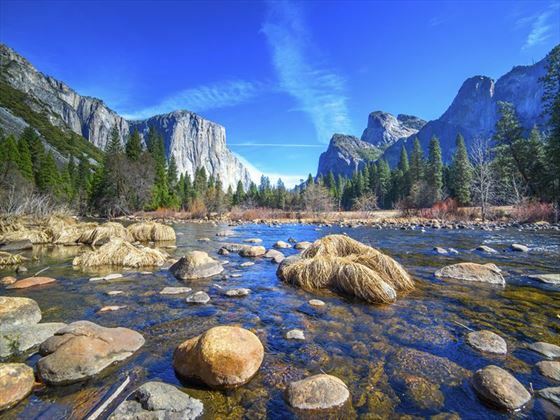 Yosemite National Park is known for its impressive waterfalls, grand meadows and spectacular rock formations, including the iconic El Capitan and Half Dome. A full day to explore this wonderful, natural playground. You can hike to a waterfall (best seen in Spring) or explore a giant sequoia grove, taking advantage of the 800 miles of trails within the park. 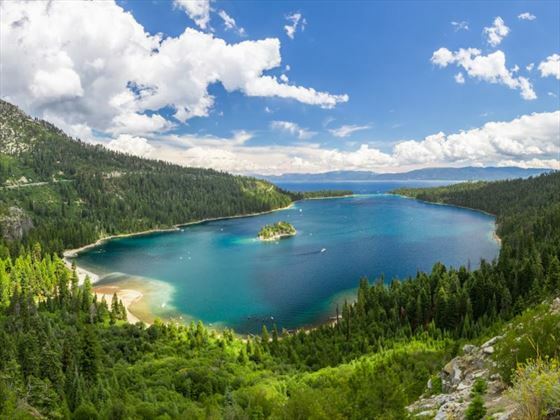 This morning head north via Bridgeport and Devil’s Gate Pass to Lake Tahoe - a jewel of a lake, surrounded on all sides by the magnificent Sierra Nevada mountains. Here you can enjoy watersports on the lake or take a cruise. Now you’ll be heading east towards the Pacific Coast and the charismatic city of San Francisco. 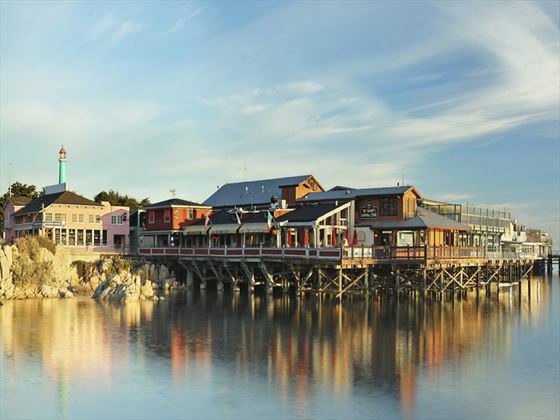 Worth stopping en route in the California capital of Sacramento, to stroll around Old Sacramento reminiscent of the Gold Rush era with its wooden sidewalks and wagon rides. 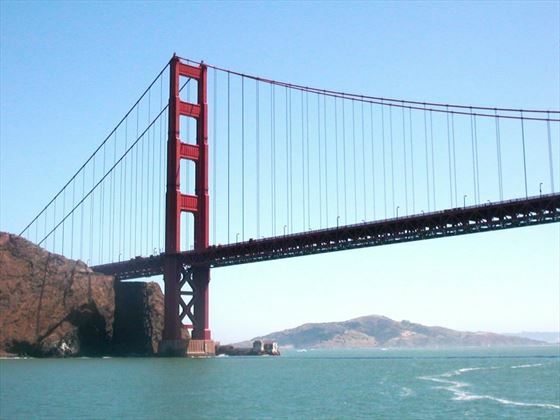 Continue onto San Francisco where you’ll be staying for a couple of nights. There’s so much to do in San Francisco, so we recommend you plan your day wisely, and if you want to go to the infamous prison island of Alcatraz please let us know so that we can pre-book your tickets. Other highlights include Fishermans Wharf, the Golden Gate Bridge, Chinatown and Union Square. After leaving San Francisco, head to the Monterey Peninsula to drive the gorgeous 17-Mile Drive from Pacific Grove to Pebble Beach – there’s a small toll charge but it’s well worth it. Now it’s time to drive the iconic Pacific Highway – a highlight of this wonderful roadtrip. 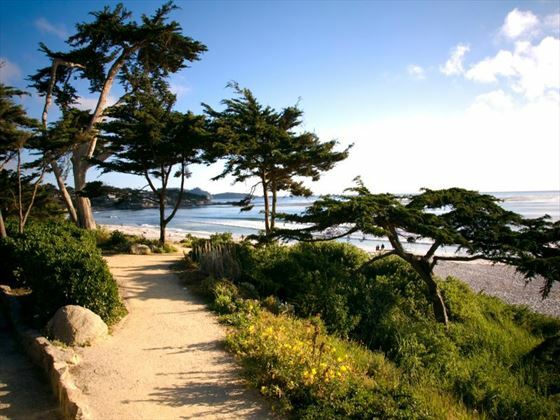 This cliff-hugging route takes you through the quaint village of Carmel, where Clint Eastwood was once mayor, and then onto the Big Sur – a stunning State Park where the mountains plunge into the Pacific Ocean. After this the rugged coastline mellows into more undulating countryside as you journey south. 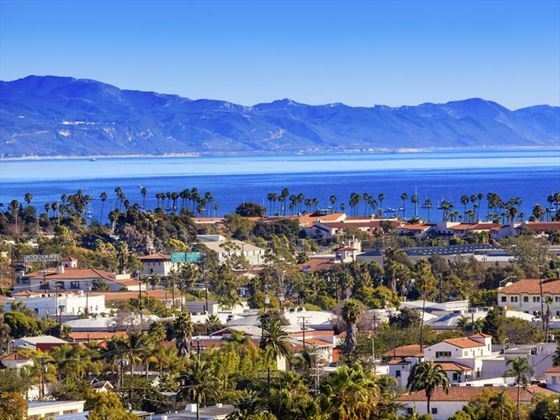 Continue your journey south, passing through Pismo Beach and perhaps stopping for lunch in the lovely resort of Santa Barbara – known as the American Riviera. Then drive onto Ventura, a classic beach resort in a great setting.